If the United States is serious about backing NATO membership for Bosnia and Herzegovina, then it has to get serious about the failures of the Dayton Peace Accords and drop its support for them as Bosnia’s governance system. They may have ended Bosnia’s civil war in 1995, but they have become synonymous with stagnation, frustration, despair, poor governance and weak institutions. This not onlyhinders the joint U.S.-Bosnian aspirations to join NATO, but has stagnated Bosnia overall, enshrining ethnic divisions (and tensions) legally between Bosniaks (Bosnian Muslims), Croats, and Serbs that have left Bosnia divided and ripe for the geopoliticalgoals of Russia. The recent elections in October that delivered a hardline Serb-nationalist who is stridently anti-West and NATO to the Bosnian presidency are evidence of this, while serving as a wake-up call to Washington that it is time to re-engage in Bosnia. Speaking this past May on the Dayton Accords, President Bill Clinton reflected that “nobody thought that the Dayton Accords was perfect. It obviously set up the possibility of paralysis.” The late Richard Holbrooke, the chief architect of the Accords, put it more bluntly, “[ it was a deal] brokered by an impatient American administration determined more to end the war . . . than to establish the basis for a viable and sustainable state.” Bosnia’s status as the poorest state in the Balkans, high unemployment, public disillusionment, and current political crisis bear testimony to this. The Accords were written with two main purposes enshrined: a legal accord ending the war and serving as a blueprint for building a stable and peaceful state. However, the Accords themselves have held Bosnia back from this second goal. The crux of the issue is Annex 4 of the Accords, which has served as Bosnia’s constitution and legally enshrined in many respects the ethnic divisions sought by the warring parties in the civil war. It divided Bosnia into two federal entities, one Serb-dominated and the other Bosniak & Croat dominated. Additionally, it defined Bosnia as a state of three constituent peoples (Bosniaks, Croats, and Serbs) but also of all citizens as well. The state presidency is tripartite, with each constituent people having a president, and rotates between all three. Likewise, all of Bosnia’s cantons must elect at least one member of each constituent people to the main chamber of their legislature, regardless of the canton’s actual ethnic makeup. This ethnic division bleeds through the entire Bosnian political system, forcing one’s ethnic identity to take precedence over their national identity, as well as hindering the growth of any national identity, and anchoring political power first and foremost in one’s ethnic identity, with all other issues taking secondary precedence. Bosnia’s current political crisis is an outcome of this constitution and the political culture that has been ingrained in the country. Nor is this a sudden crisis, with the need for reform being kept at the forefront by the 2009 decision of the European Court of Human Rights that demanded Bosnia change the ethnicity-based manner in which the presidency and parts of the legislature are determined, the countrywide demonstrations in 2014 demanding reform that led to multiple government buildings being torched, and the Ljubic court-case decision in 2016 determining the electoral mechanism to establish the House of Peoples in the Federation of Bosnia and Herzegovina violates the constitution have all served as warning signs that both Bosnia and the international community have blared past. However, the election of Milorad Dodik, a Bosian-Serb nationalist strongman under U.S. sanctions for defying Bosnia’s Constitutional Court and obstructing the Dayton Peace Accords, to the presidency as well as heightened calls by Croat-nationalists for a third and separate Croat entity in Bosnia coupled with Russian support for both groups should put the final nail in the coffin on U.S. support for the Accords. Dodik has not been timid on his positions : openly using hate speech against Bosniaks, calling for the independence of Republika Srpska, promising to prevent any implementation of NATO’s Membership Action Plan in Bosnia, stating Bosnia as acountry shouldn’t exist, and putting forward an incredibly divisive promise that he will “work above all and only for the interest of Serbs.” Dodik and Croat-nationalists have agreed on future cooperation to further their goals , goals that would be realized in the face of a further weakened and ethnically divided Bosnia and that run counter to the prevailing views of the majority of Bosnians and their aspirations for further Euro-Atlantic integration. And this is exactly why Russia is supporting both of these groups. Russia views the Western Balkans as a new battlefield in its political war with the West and has made its position clear: stop Bosnia’s Western integration and stymie ambitions of joining the EU and NATO. To that end, Russia has thrown its support behind nationalist actors in Bosnia that seek to undermine the central Bosnian state through a variety of different avenues. With Dodik in power, Russia’s support has already started to pay dividends beyond the effect of his divisive speeches and promises on Bosnia’s politics. Dodik has reiterated his position on Bosnia not joining NATO since ascending to the presidency (denying the consensus between the three presidents needed to move forward), brought forward proposals to further decentralize the Bosnian state and strengthen Republika Srpska’s powers, sent a protest letter to President Donald Trump criticizing the United States for congratulating the presidency on Bosnia’s statehood day, and has demanded the dismissal of sixteen Bosnian ambassadors to be replaced with handpicked pro-Serb candidates. Concurrently, after having the lost the presidency to a more moderate candidate, Croatian nationalist have sought to undermine the recent election and amplified their calls for a third Croat-dominated entity in Bosnia. While the United States and NATO attempt to prod Bosnia forward in the direction of the ambitions of its people, many of its political elite are more than content to see how far they can pull along the seams of the country before it breaks apart to their own political benefit and it is the Dayton Accords that have given them the platform to do so. As it stands, so long as Dodik is in power, the idea of Bosnia joining NATO is dead in the water while what progress Bosnia has made since 1995 falls under the looming threat of nationalist politicians more concerned with shoring up their power bases than the progress of Bosnia as a whole. The United States must work with the EU, the UN and most importantly the Bosnian people and their representatives in an earnest effort to reform the country, starting with abandoning Dayton and legalized ethnic divisions. So long as power lies along ethnic lines it will continue to create exploitable divisions. The United States, in concert with its partners, must work towards a system that successfully and rationally embodies the principles of federalism, decentralization and legitimate representation that the EU has stated are prerequisites for ascension. 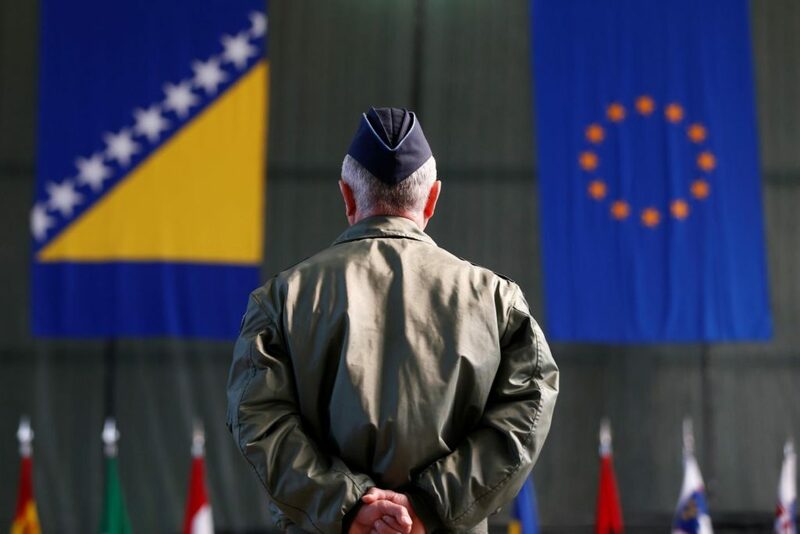 The majority of Bosnians desire to join the EU and NATO and this is a point that must be seized upon and stressed to the political elites that benefit from the current political system in Bosnia. At the same time, the United States must step up its support for civil society in Bosnia at a time that it is in financial disarray. USAID’s Civil Society Sustainability Project is already in place and is ripe for enlargement as the United States seeks to engage Bosnians at all levels of society. Finally, the U.S. must recognize that this is a long-term commitment to the region that will take time to bare change. Nationalist views and positions have become entrenched and myths of hatred have fermented into reality in the last twenty-five odd years and will not be swept away over night but will require a persistent effort to be unwound and permanently rebuffed. Sean P. Maguire is currently a research assistant in the Food Security Program at the Stimson Center. Maguire previously worked in the Stimson Center’s Defense Strategy and Planning Program, where he focused on the use of U.S. military force in pursuit of foreign policy goals. Sean Maguire obtained his M.S. in Global Affairs from Rutgers University and his B.A. in International Political Economy from Fordham University. Ryan Scherba is currently an editor of Balkan Insider and a graduate student at the Institute of World Politics pursuing a degree in International Affairs and Statecraft with a specialization in Peace Building, Stabilization, and Humanitarian Affairs. Ryan Scherba previously served as a Peace Corps Volunteer for two years in Kosovo and obtained his B.A. in International Affairs from Marquette University.